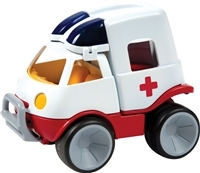 Rugged and sleek design pretend play toy vehicles include popular favorites like police car, fire truck, ambulance and farm vehicles. Speed buggy garage has two buggies and locking garage doors. 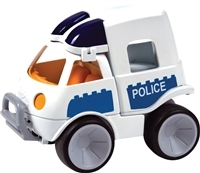 Sturdy police van is approx. 5" long. Sturdy EMS van is approx. 5" long. 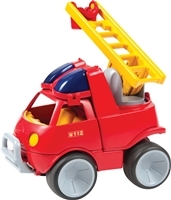 Sturdy ladder truck is approx. 5" long. Sturdy tractor is approx. 5" long. Sturdy tractor is approx. 9" long.